Athletics (track&field), and more specifically sprinting, has been a big influence in my life. I started in 1987 (at age 9). I wasn’t a natural talent at first, and it took me a few years to discover that I was most skilled in the shorter sprints. In 1994, I started actively competing in races. I did quite well on a national and regional level from 1995 to 2005, but stopped training competitively due to injuries in early 2006. I didn’t race at all for a number of years, but as of late I’ve done a few more competitions based on more limited training. My performances in the early months of the 1995 season brought me closer to the top performers in the country at that time, and I found myself in the training group for the 4x100m relay at the Games of the Small States of Europe. I didn’t make it into the race team, but had only narrowly missed it; which gave a considerable boost to my motivation. In 1996, I switched to doing all my training with Marc Dollendorf, and was gradually improving my strength and sprint endurance. I broke the 11″ barrier on the 100m by doing 10″90 (+1.1m/s) at the National Championships in July; surprising everyone and taking home the Silver medal. My 200m also improved quite a bit, down to 22″01 (+0.8m/s). At the end of the season, I participated at the European Cup for Juniors in Istanbul, Turkey. It was my first national team selection that took me further than the neighboring countries. I still vividly remember the trip and many people from the team. This was one of my more memorable competitions, not necessarily because of any specific thing that happened on or off the track, but the team spirit and the fun we had throughout the entire weekend. By 1997, I was training six times a week. I had qualified for the Games of the Small States of Europe in Iceland on both the 100m and 200m. The 4x100m relay team (with Marc Reuter, Bernard Felten and Thierry Eischen) had also done quite a few preparatory races, the fastest being a 41″49 in April. All week long in Iceland, there were chaotic weather conditions (arctic temperatures and wind gusts of up to 10 m/s on the day on my 200m). I had a bad start on the 100m, finished fourth on the 200m (in a new personal best of 21″92) and won a silver medal with the 4x100m. The European Cup Bruno Zauli in Denmark later that month was my first competition at a truly international level. It was mostly a humbling experience, and I wasn’t overly happy with my 11″30 100m or 22″69 200m. In January 1998, I ran a new personal best on the 60m in Saarbrücken (Germany): 7″00. A week later, I managed to break the Luxembourgish National Indoor Record on the 200m in Dortmund (Germany) by running 22″00. I would be the record-holder on that distance for the next three years. That year in summer, I also ran my personal best times on the 100m and 200m, 10″85 (+0,9m/s) and 21″58 (+0,4m/s). <p>Plagued by some injuries and unable to start at the Games of the Small States because of school, 1999 wasn’t a stellar year. I ran 10.97 (+0.8m/s) on the 100m and 21.95 (-1.3m/s) on the 200m, and set a personal best on the rarely-run 300m in 35″75. In January and February, I equaled my 200m Indoor record two more times, running exactly 22″00 each time. Summer 2000 was going to be my best season yet, but during a training camp in April my left Achilles tendon started acting up. I kept on pushing even though the pain increased dramatically over the next months, clocking season bests of 10″92 on the 100m, 21″72 on the 200m and 49″70 on the 400m. In July, I could barely walk anymore, let alone run. An MRI confirmed that I had a fissure in the left tendon. I rested over summer, and underwent surgery in October 2000. Recovery after the operation turned out to be more complicated than anticipated, requiring me to skip the 2001 indoor season. In summer I passed my final exams in school. This meant I had to pass on the Games of the Small States once more, and ended up only doing 10 races in summer. My best performance for the year was a wind-assisted 10″97, but overall 2001 was a step back compared to previous years. The highlight of the season was the European Cup Bruno Zauli (Riga, Latvia). In difficult outside conditions (cold, wet), I did a 100m in 11″14. In 2002, my interests gradually began to shift away from track. Working full-time took its toll on my training performance, and I started doing more international travels that also had a negative impact on my training planning. My 2002 bests on the 100m and 200m were 10″97 and 22″01 respectively. One of the highlights of the year was the European Cup Bruno Zauli in Tallinn, Estonia. I ran a 4x100m with Laurent Pater, Daniel Abenzoar and Claude Godart, and despite not being the fastest possible constellation we ran Luxembourgish season’s best in 42″25. In the fall of 2002, I was able to train five times a week again. For the next few months I had the luxury of working with three different coaches, one each for their respective strengths: I did sprint training with Marc Dollendorf, strength training with Bernard Felten and my running technique improved with Jean-Marie Branle. At the first indoor track&field meeting in Luxembourg on January 12th 2003, I ran the 200m in 22″01 and the 60m in 7″10. I didn’t manage to better the 60m time at any subsequent meeting, but finally broke the 22 seconds barrier on the 200m three weeks later, running 21″92. As of 2017, this time still stands as the second-fastest 200m indoor time by a Luxembourgish athlete. In summer, I participated at the Games of the Small States in Malta, but was once again slowed down by injuries – this time by both Achilles tendons giving me trouble. After returning from Malta, I decided to take it slower. Increasingly, my energy was taken up by traveling. I spent January 2004 in California (and thus, skipped the indoor season). I went through several changes in my professional life. In May, after my job situation stabilized, I figured I’d take the chance and compete again. While my 2004 bests (11″18 and 22″44) were above what I had previously been competing at, I was glad that I could still compete, and that I was able to join the national team on selections that took me to France and Iceland. 2005 didn’t start very well – during the winter season and early spring I had several injuries, and had to be very careful in the planning of my training. I still tried my best to run the (indoor) 22″20 required to qualify for the Games of the Small States of Europe in Andorra, but was about 2/10 of a second too slow. I was part of the 4x100m that did 41″93 at the beginning of the season, and as such qualified to go to the GSSE in early June as part of the relay. 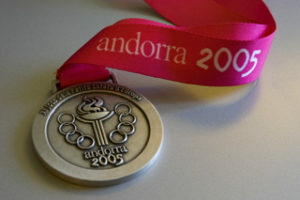 In Andorra, Johan Mordijk, Daniel Abenzoar, Claude Godart and I did 41″22 in the series and 41″32 in the finals, and we came home with a Silver medal. We ran the best 4x100m time since 1995 and would have beaten the National Record too, except for the fact that Johan didn’t have Luxembourgish nationality at that point. In late June, after a busy (100m, 200m, 4x100m) weekend at the European Cup Bruno Zauli, my 2005 season was pretty much over, owing to more Achilles tendon trouble. I paused for two months, and spent extensive time at both the sports doctor and physiotherapist. Initially, this was successful enough to enable me to restart training at the end of September, but unfortunately the inflammation in the right Achilles tendon had become chronic. In early December 2005 I felt like I had exhausted all options and had no other choice than to give up on track training. I decided to put an end to my track&field career in January 2006. In July 2010, while I was in the midst of preparing a Mont Blanc ascent, I decided pretty much on a whim to compete at the National Track Championships. My time of 11″74 in the series was nothing to write home about, but it still allowed me to qualify for the finals. My priorities lay elsewhere at this point though, so that this competition remained the only one for quite a while. In October 2011, now 34 years old, I decided that I wanted to challenge myself once more. I started diversifying my training with increasingly longer (trail) runs. In late December, I ran my first indoor competition in eight years, setting a new PB on the 300m since I hadn’t run one since my junior years. In January 2012, I ran two indoor competitions, a 60m in 7″43 and a 200m in 23″43. It had been nine years since I’d last raced these distances, so I was a little rusty and didn’t manage to qualify for finals. An injured abductor abruptly ended the season. Summer 2012 went without a single race mostly due to working on and moving into our house. I ended the year with a late-December indoor 300m, which I ran in 37″79. I was quite happy with my 2013 indoor season, which marked my first season as a M35 Masters runner. At the national indoor championships I ran 22″97 (series) and 23″01 (finals), as well as 7″36 (series) and 7″32 (finals) on the 60m. I was quite happy to reach the finals, and almost a little surprised that my body supported four sprint races in one day, each at 100% effort. Outdoors, I pulled something in my hip/groin area during the first racing weekend in April, which had a severe impact on the rest of the season (meaning there was almost no rest of the season). The 11″56 from mid-April ended up being my best time for the year. In the 2014 indoor championships, I did my first false start leading to a disqualification. That race would probably have improved my M35 60m indoor time, but as is I only did one single 60m in 2014, in 7″43. The two indoor 200m races were not stellar either, and my heart wasn’t in them. The best was 23″57. In summer, I did a few more 100m races and two 4x100m relays for my club. My 100m best for the year was 11″65 before I faced more Achilles and hip/groin trouble. Rather than giving the Achilles tendon the rest that was called for, I attempted to power through the injury. After I could no longer do any sprint training, I switched over to jogging and training for mountain running/walking, and successfully competed in three races in May and June. Over time, the Achilles got so bad that even walking was painful, and I realized that I’d need to take treatment and recovery more seriously. In July of 2015 I started a six-month stretch of 18 doctor and 24 physiotherapy appointments. I received shock wave and laser treatments, and thankfully the combination of expert treatment and careful selection of training efforts and recovery times led to a marked improvement towards the end of the year. I competed at three indoor competitions in January. While the times were again slower than my efforts in previous years, I was quite happy with the outcome given the long-term injury and difficult recovery in 2015 that had me going into the season with fairly mineral base training and very few specific sprint efforts. Nevertheless, I decided to sign up for the European Masters Athletics Indoor Championships in Ancona, Championships, where I reached the semi-finals in both the 60m and 200m. I did compete a few more times in summer to help out my club, but the results were not great. Despite investing more time and energy into the winter season, my 2017 indoor season was disappointing. I did qualify for the final on the 200m, but the times on both the 60m and 200m were considerably slower than past years. In summer, I barely competed on the track, and instead successfully ran longer trail- and Skyrunning races in the mountains.